This years Christmas was different than most. We didn't attend holiday parties or go Christmas shopping or decorate our home, we spent it in the cozy accommodations of the Duke ICU. As much as we love this time of year and all the celebrations we couldn't help but be eternally grateful for this gift Kyle was given. Despite the hardships this transplant has brought us and the mental fatigue we have endured we continue to reflect on the amazing family who honored us with the organs of their loved one. This miracle comes with an immense amount of emotions. I can't put into words how this unselfish gift has given Kyle and I an opportunity at a new and healthier life together. As Kyle and I walk the halls of the ICU, we see countless families touched by organ donation. We have become close with many families as they attended the pre-transplant lectures, and endured countless physical therapy sessions together. I have seen the blood sweat and tears of each organ donor recipient, and they all are working hard to make the most of their precious new gift. Our card display from our wonderful friends and family. As I said, this journey has not only effected us but our families and friends at home. We were lucky to share the holidays with both of our families as they traveled to North Carolina. Each of our families made the best of the situation and brought the Christmas cheer to us. Despite the missing Christmas tree and stockings it felt like Christmas with our family near. 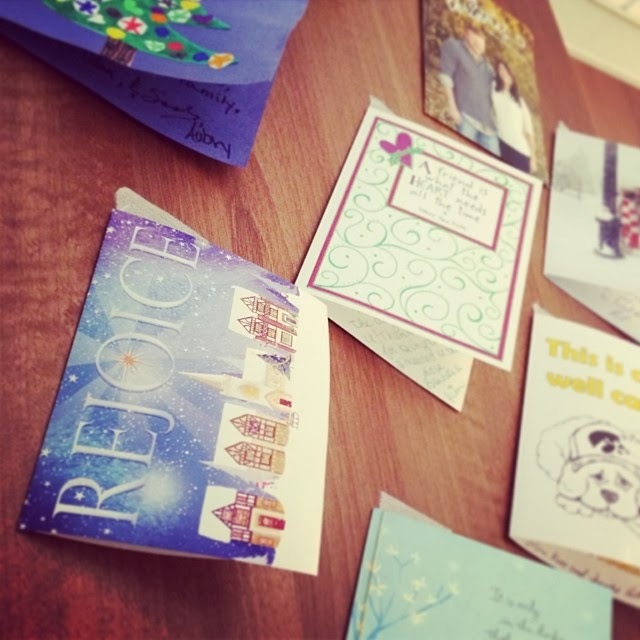 Not to mention the beautiful Christmas cards, and letters they brought with them. All signed with well wishes from our friends/family, neighbors and community. Every act of kindness we have been shown warms my heart. I hope that we can someday give back and return the love we have been shown. I often reflect on how lucky we are and wonder what we have done to be surrounded by such wonderful people. The day before Christmas eve Kyle's doctor told us the team had decided to remove the lower left lobe of his lung. A biopsy done the previous day had showed the lobe wasn't taking to the hyperbaric treatments and continued to look dead and necrotic. Of course my first thought was, "Merry Christmas to us," but after realizing the possible issues the necrotic lobe could present I knew they had his best interest at heart. Removing the lobe as soon as possible was the best option. Thankfully my family had gotten in earlier then expected so they could see him the night before the procedure. Fresh out of the operating room, Kyle was not nearly as out of it as he was for his previous procedures. He was awake and able to talk to us. Before the procedure we both had a bit of anxiety because his last procedures were filled with complications. Gratefully, this surgery only lasted 3 hours and it went as smoothly as they had hoped. They supplied him with an epidural so he wouldn't experience as much pain coughing or moving. The biggest thing for lung transplants is just that, moving and coughing, they don't want them hindered by pain. Before you know it he was back making laps around the ICU only a day or so later. Kyle and I on Christmas day. Once the lobe was removed I could see past the pain, and temporary stiffness to see he was making progress. We started walking more and more, and he stayed off the ventilator for over 48 hours making him eligible to go to Stepdown if all else aligned. Although 48 hours was their standard they kept Kyle an additional day to keep an eye on his CO2 levels (and nothing much happens on the weekends). I tried to contain my excitement as I had been let down before. I really thought Kyle had looked the best he had ever looked off the ventilator and he was even able to sleep a little here and there. Upon entering the Stepdown unit on the 7th floor ( just a walkway across from the ICU) it felt like a completely new place. Although the layout was identical there wasn't as many filled rooms, or bells and whistles sounding. Another perk of Stepdown was he wasn't attached to as many cords and wires and all his chest tubes had been removed. Seeing him attached to less just made him look less fragile, as he was able to move and boost himself in the bed. This new change felt great, and I was happy they would let me take him on walks whenever I wanted without being accompanied by a nurse. This made reaching 20 laps around the unit all that much easier to accomplish. I even started doing his sacrum, and foot dressings daily. As soon as we thought things had lightened up they took him down for a chest x-ray only to find out he had a fluid pocket in the area where they had removed the lower lobe. It is pretty normal to have build-up of fluid in areas that have been removed but they were slightly concerned with how quickly it had progressed so they tried to schedule a guided chest tube placement. This would allow them to use an x-ray to find the fluid in his body and place the tube to drain the fluid. The only issue was it was New Years eve and they had no availability to complete the procedure. So we had to wait, which was hard to hear because I knew it was causing Kyle to have more labored breathing. A day or so later they let us know that the biopsy (where a small sample of his lower left lobe was removed) done prior to his lobectomy was showing signs of bacteria growth. They didn't know if it was isolated to only the lower lobe, the area they just removed, or if it had progressed to the upper area. To take precaution they started him on some breathing treatments and heavy antibiotics to contain the issue. Sadly, the combination of antibiotics, him needing to get the fluid removed from below his lung and not being able to sleep made for a hard few days. 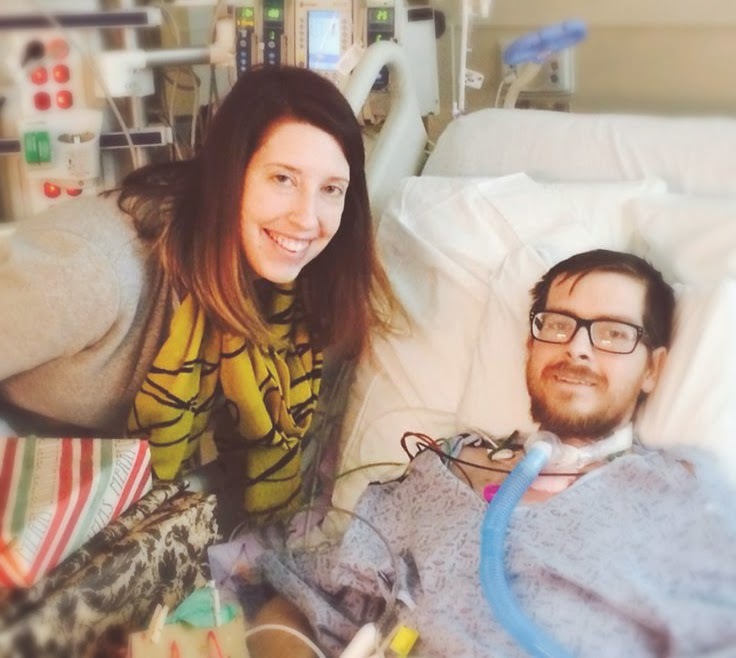 Eventually they were able to schedule him to have a chest tube placed which helped make his oxygen saturations go up, but the higher saturations were accompanied by pain of yet another chest tube. Not to mention its placement was awkwardly situated on his back. During those last few days his CO2 levels were trending down which gave the doctors an idea to downsize his trach as long as his CO2 didn't exceed 65. Of course we were happy to hear this as it is much easier to speak with the valve with a smaller trach. The following day his Co2 was 70 so they decided against the procedure. Despite this news I knew it would be for the better as he was still having issues sleeping. He was only getting about 2-3 hours a day which was causing his energy level to drop. They couldn't really put their finger on the reason for the lack of sleep. They tried every sleep aid they could (that wouldn't suppress his respiratory) and even worked with stress management for sleeping and calming techniques. His body just didn't seem to trust itself to sleep. The minute he would fall asleep he would snap back awake, occasionally de-stating and then his numbers would climb back up after he awoke. As of today they decided to have him try vent therapy at night so he could regain his strength and then eventually try a bipap machine to see if he has success sleeping. We are awaiting a new room on another floor that isn't ICU but chronic pulmonary related. There he will receive vent treatments without bouncing back to the ICU seeing as his ventilator needs are not immediate or critical. He continues to fight his mental fatigue as he pushes through the ups and downs of his journey. The decision to donate has not only effected Kyle and myself but all those who love Kyle. Our lives will never be the same and we will forever cherish this hard but beautiful time. 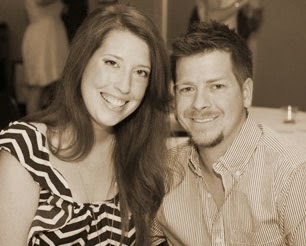 We are continually grateful for the prayers and love. We pray he continues to gain strength and is able to sleep on his own soon without issues.